Monaco is not only a destination for rich tourists. 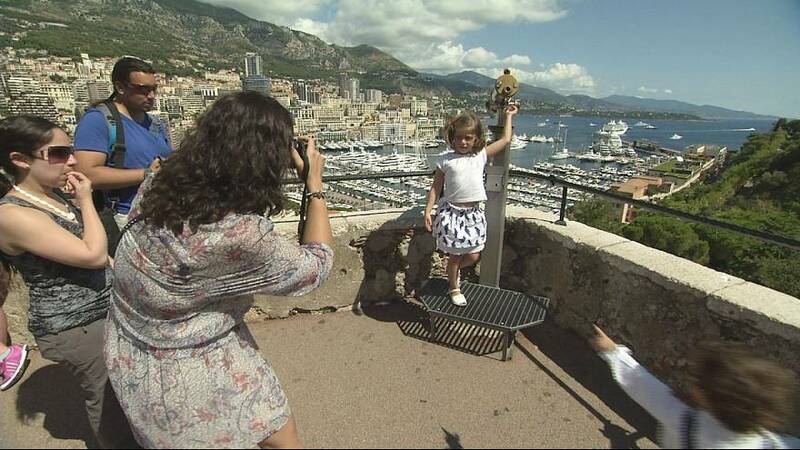 Seven million people every year come to Monaco for the day. This type of tourism is the result of the boom in cruises -some 170 ships stop off in Monaco between May and October every year. Day trippers also come from nearby – whether they live there or are just there for holidays. And they are all sorts of nationalities. So shopkeepers in Monaco have not really felt the economic crisis. High end, business, and economy combined, tourism brings around 450 million euros a year into this tiny state – that is more than 10% of the national wealth. It is difficult to evaluate exactly how much people spend during a day trip but it is easy to know which are the most popular attractions. Perched on the cliff top, the Oceanographic Museum is a big star. Inaugurated in 1910 by the explorer Prince Albert I, this architectural jewel draws more than 600,000 visitors per year. But the Royal Palace is top of the list of attractions. And taking photos of the changing of the guard doesn’t cost a penny. Crammed into two square kilometres, it is possible to see the whole of Monaco in a day for a minimum outlay. These dreams are priceless, but they’re free.